PlayStation Classic review: "A strange mix of joy and disappointment"
Nostalgia is a mysterious mistress. 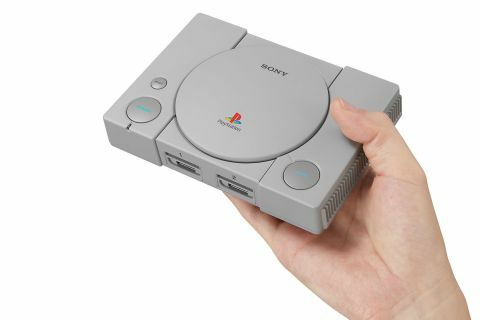 On the one hand it'll have you literally squealing with glee as you lift the adorably miniature PlayStation Classic out of the box, and realise that's it's exactly the same console as you remember just 45% smaller. Passing it around the GamesRadar office was met with actual giggles of glee and mostly people getting excited about just how small it is. But on the other hand it'll be the thing fuelling that slow spread of disappointment as you realise the games you played over 20 years ago don't look as good as you remember. For those out of the loop, the PlayStation Classic is a mini-console released with the intention of celebrating PlayStation's heritage and delivering a massive slab of nostalgia to those who played the original PlayStation back in the days of the late '90s. It comes with 20 games pre-installed, two wired controllers that are the identical duplicates of the original pads, complete with lack of joysticks that constantly gave me some kind of weird, wandering thumb looking for the right analogue stick for camera adjustments. Opening up the box, it's clear that PlayStation Classic’s core appeal is aesthetic. This is 100% the original PlayStation console you remember from your youth, just in miniature. Every single port and button from the original design is there with some modern tweaks, with the reset button taking you back to the list of games, open disc button digitally switching between discs for multi-disc titles, and the power button is obviously still the power. Heck, there's even the detailing on the flap for the original Parallel I/O input, although the input ports on the rear have been streamlined to a single HDMI output, and the original A/C input replaced with a micro USB port. The dinky little PlayStation Classic runs on a micro USB cable only, and connects to your TV via HDMI, making the entire setup process only take around a minute or so. Well, it would but it turns out that unlike the NES Classic Mini and SNES Classic Mini, the PlayStation Classic needs more power than the average USB port on a 4K TV can provide, meaning you need to source a USB port that supports USB power source that supports 5V, 1.0A (minimum) output, such as a USB AC adaptor. Seeing as an USB AC adaptor doesn't come in the box, and not everyone has 10 million of the things lying around their home like I do, that might come as quite the frustration to the average consumer. But despite that, the sheer joy that comes with holding the PlayStation Classic will outweigh any frustrations people will have with AC adaptors. Even the external packaging is the same as the original, albeit missing that "free demo disc" splash across the bottom right hand corner that mine had. And the console itself is an absolute delight. And then the boot up. Oh boy, the boot up. It's amazing how a simple tune can catapult you straight back to childhood, but that screen, combined with that startup noise is nostalgia-inducing to the point it can send goose pimples around your body in a heartbeat. Although there are plenty of games that honour the console’s ‘classic’ monicker - Abe's Oddysee, Metal Gear Solid, Final Fantasy and Resident Evil for example - it's hard not to see the missing pieces in the line-up. The games are presented to you on a spinning carousel of cover art, with useful information give you to up front like whether it supports one or two-players, the last digital save you've got on file. Helpfully you can 'suspend' up to 15 games to pick up where you left off, rather than having to rely on the notoriously cruel in-game save points that don't really work in the modern age anymore. It's a slick menu system, and delightfully retro in a number of ways, including the little digital replica of the original PlayStation memory cards. However, it's difficult to see beyond the technical limitations of the games themselves. As someone who's bought both the SNES and NES Classic Mini consoles that Nintendo has released over the past couple of years, it's interesting to see just how hard it is to make 3D games hold up after 20 years compared to 2D pixel games. Playing Cool Boarders for example, the tracks can barely keep up with the pace of your snowboarder as you fly through the scenery, with screen tears happening all over the place. Of course, that's exactly how they played 20 years ago, it's just that the rose-tinted glasses of your memory leave you expecting more today. If you're hoping that these games are going to live up to what you thought they looked like all those years ago, you might come away disappointed, by they might well serve as a mirror for just how much games have changed in 20 years. But if you want an exact recreation of the entire PlayStation experience from 1996, this is what you're going to get, and in plenty of ways that's utterly wonderful. Another problem is the length of the controller cables. They're nowhere near as short as the NES Classic Mini, but even in my tiny living room we had to sit cross-legged on the floor in front of the sofa in order to play comfortably without yanking the PlayStation Classic off the TV stand. The controller cables are 1.5m/59.1-inches, so not incredibly short, and it will depend on your living room, but it was definitely an issue for me. Because of all that, the PlayStation Classic becomes a difficult sell. It retails for the fairly pricey figure of $99.99 / £89.99 (in comparison the NES Classic Mini is $59.99 / £49.99 and the SNES Classic Mini is $79.99 / £69.99), and the presentation of the games, along with the actual line-up of games, is never going to appeal to everyone. It's wonderful for that initial wave of nostalgia - from the console itself, to that loading screen and then starting up one of your childhood games - but be prepared that the glorious nostalgia bath can leave you covered in suds of disappointment.